Do you really know what’s in your food? Are so-called ‘Low fat’ products really good for you? Here, our Customer Transformation Coach has extensively researched this topic to reveal the truth about healthy sounding foods! We are indeed a nation of dieters! We love a new product that claims to be high in fibre or fortified with vitamins but are these really good for us? There are so many foods on our supermarket shelves these days that claim or even look to be healthy. Well do not be fooled. 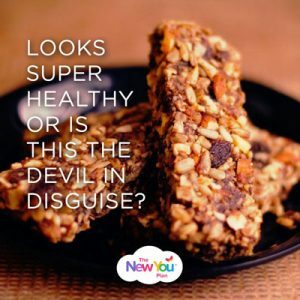 From frozen yoghurt to cereal bars, they are not what they seem! We should all make our best effort to eat healthily but this can be so confusing when we are bombarded with adverts, deceiving product placement and clever packaging which screams THIS IS GOOD FOR YOU! I have researched and created a list of food items which should be avoided or eaten infrequently. These products are laden with artificial sweeteners, refined grains and nasty E numbers. 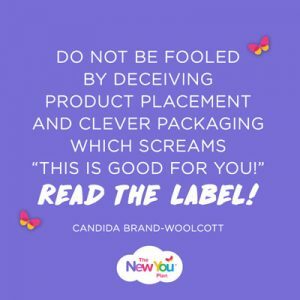 It is so important to be wise and mindful when you venture out to health shops and super markets; choose carefully, reading the back of packs and don’t be fooled by the devil in disguise. These are filled with preservatives, sodium, sweeteners and not to mention additives we cannot pronounce. You would be better off drizzling a little olive oil and cider vinegar. Where do I start with this one! The calories in a bowl of granola or a granola bar is phenomenal. With added sugars, fruit pumped full of sweetened fruit juices and salt it really is best avoided. You are better off making your own healthy version. Step away from the chewy dried goji berries and the trail mix. These are not a healthy snack. Why? Dried fruit has WAY more sugar than fresh fruit. Your brain finds it difficult to say no to dried fruit because fructose is not capable of sending any sort of signal to the brain to say you have had enough. There is fructose in fresh fruit too which can make you fat fast. Limit your intake. Have a handful of fresh berries instead! This is perhaps one of the worst things you can consume. Caffeine packed, sugar laden and a concoction of potentially harmful ingredients, energy drinks can affect your teeth, liver, kidneys, immune system, heart, and lead to weight gain and diabetes. We are not super humans – we need to rest and relax. We do not need these horrific drinks to keep our energy levels up. Eating sensibly, staying active and resting when required is all you need for energy. All these pre-packed fruit and veg have to go through many processes before they reach the shelves. As soon as they are harvested, levels of nutrients in fruit and vegetables will begin to decrease. However, this will be accentuated by further processing — particularly cutting or peeling. Depleted vitamin C and nutrients make this product a no-no. Go for fresh when you are able to and prepare it yourself. It’s much healthier, not to mention cheaper. Please don’t fall into the reduced or fat-free trap. Just because something is fat-free does not make it healthy. In fact, many flavoured yoghurts have upwards of 15 grams of sugar in that minuscule 170g serving! I would advise that you add your own flavours and whole fruits to Greek yoghurt. It looks so healthy, all malty brown and deliciously nutty looking. Sadly, multi-grain bread is made from refined grains, so all the goodness has been removed. Go for whole-grain breads instead! The sad, sad truth about frozen yoghurt, surely not! It sounds so healthy and a great alternative to ice-cream. Think again! It’s full of some real horrors such as guar gum, cellulose gum, disodium phosphate and propylene glycol monoesters and thickening agents. Yuck! 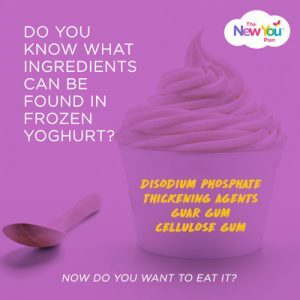 You might find the odd natural ingredient but in truth, frozen yoghurt is full of artificial ingredients. You would be better off making your own ice-cream. Did you know that smoothies can contain the same amount of sugar as a large Coke? Juicing fruit removes all the fibre and some of the nutrients which is good for us. I am afraid to tell you that smoothies contain deceptively high amounts of sugar. So, unless you have a smoothie maker at home that does not break down the fibre in the fruit, I would steer well clear of shop bought ones. Some say, that you are better off having a fizzy drink rather than a fruit juice. I can see where they are coming from and the reasoning behind this bold statement is that when fruit is crushed or pulped it releases sugars called fructose and loses the majority of the fibre content. I certainly do not advocate fizzy drink in any way but you do need to be cautious when it comes to fruit juice. Drink only 100% fruit juice and in moderation and remember to check the label for any additives. I am afraid the list is endless but I hope this has given you an insight into the hype and adversity that goes with so called healthy food and drink! When you are next out shopping and you see all the wonderful nutty snack bars and pre-packed dried fruit and nuts, all I ask is that you read the packaging and avoid all those chemicals, sugars and salts! Your body is a temple after all, and you simply get out of it what you put in! The first step in your journey to a brand new you begins with getting started! So that you can fully understand how our plan works, our Get Started page was designed specifically for people new to the plan.